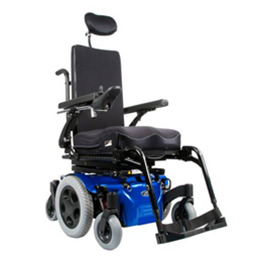 The Quickie® Pulse™ is a compact, durable power wheelchair that gives you infinite indoor accessibility and in-town driving capabilities. 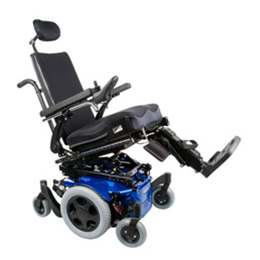 Its reliable motors, simple electronics, and seating options give you just what you need to make the most out of your day. 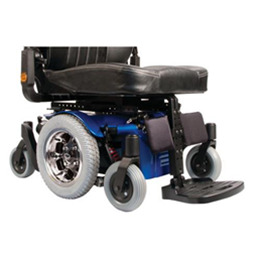 The Quickie® Pulse™ features one of the smallest footprints in its class at less than 34" in length and 24" in width. A mid-wheel drive base allows the Pulse™ to turn on a dime. The combination of a small footprint and mid-wheel drive performance allow you to maneuver around your indoor spaces with confidence and ease. Now available with a Black Tire Package and 15 shroud colors options, the Pulse™ is sure to have a look you'll love! ©2014 Sunrise Medical (US) LLC. Used with permission.